← Aisha – The Mother Of The Believers! This is the 5th in a series of Arba’in (Forty) Hadith collection series. 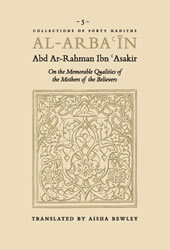 Beginning with biographical notes on the wives of the Prophet (may Allah bless him and grant him peace), Ibn ‘Asakir takes the reader through a remarkable collection of hadith describing the virtues of the ‘Mothers of the Believers’, an appellation invested on the wives of the Prophet (may Allah bless him and grant him peace) by the Qur’anic text itself. Abd Ar-Rahman Ibn ‘Asakir born in a scholarly Damascene family in the 6th century (Hijri), Ibn ‘Asakir became an accomplished jurist, hadith specialist, and a prolific author. His learning had a profound effect on him and he was noted for his asceticism, devotion and tearfulness. Posted on May 19, 2011, in Books and tagged Books. Bookmark the permalink. Leave a comment.